Writers’ stories help us process the beauty and pain of the world. If writers don’t get the support they need, theater cannot continue. That’s where DGF steps in. Dramatists Guild Foundation (DGF) is a national charity that fuels the future of American theater by supporting the writers who create it. 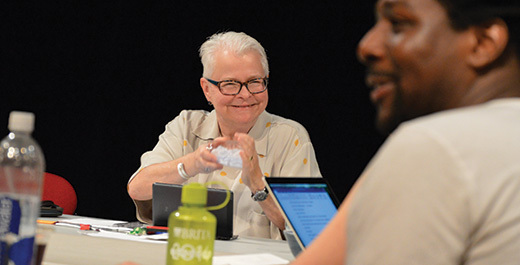 DGF fosters playwrights, composers, lyricists, and bookwriters at all stages of their careers. We sponsor educational programs; provide awards, grants, and stipends; offer free space to create new works; and give emergency aid to writers in need. By supporting and nurturing the creators of today, we protect the stories of tomorrow. We depend heavily on contributions from individuals in order to carry out our mission. Your support helps to ensure that writers across the country can continue their vital work.